Every now and then, I come across a sauce or a mix that not only makes life easier but is so yummy that I want to buy stock in the company. That was the case with the Stubb’s Hatch Chili Cookin Sauce. I picked some up at my local grocery store to give it a try. 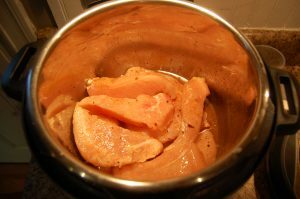 Now this sauce is usually made by using a Crock pot or by cooking in a skillet. 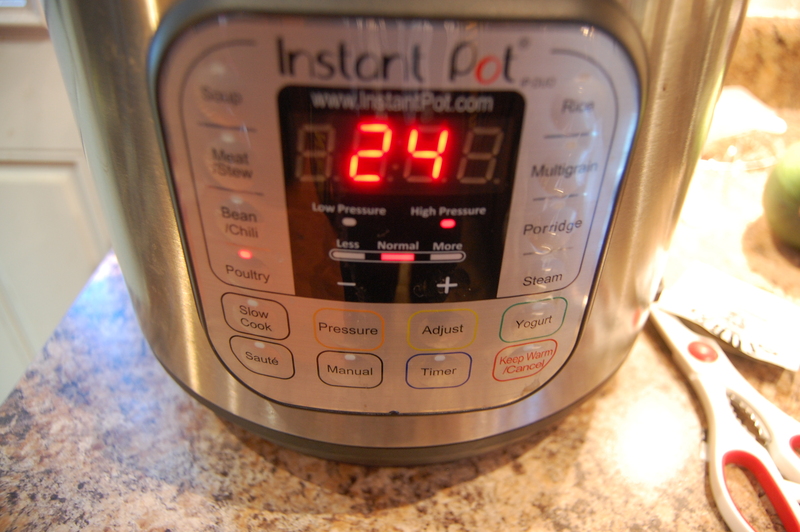 But I wanted to see if I could use it with frozen chicken and use the Instant Pot. Not only was it a success, it was so good the next day I went back to the store and cleaned out the packages they had off the shelf! The process was actually pretty easy. I used about 1 1/2 pounds of chicken thighs the first time I did this and this time I used 2 pounds of frozen chicken tenders. I have to say, I liked the thighs better. They were both good but the thighs were less dry. 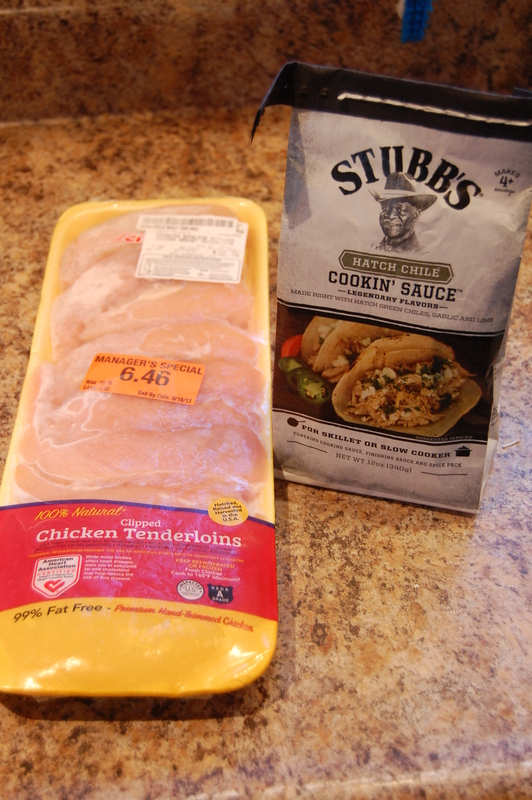 There are three packages in the bag of Stubb’s Hatch Chili Cookin Sauce. There is a seasoning packet, a cooking sauce and a finishing sauce. I read the directions but changed them up because I was using frozen chicken and the Instant Pot. I first mixed the cooking sauce and the seasoning pack together with about half a cup of chicken broth into the bottom of the Instant Pot. I then laid the frozen chicken inside, using my hands to coat the chicken with the sauce as much as I could. 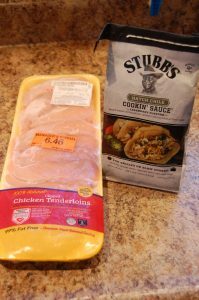 I didn’t worry too much about it because the sauce will have no problem penetrating the chicken and making it very flavorful. Since this was frozen chicken, I set it for poultry but pushed it up to 24 minutes. That worked for both the thighs and the breast meat but I imagine you could go a little less on the breast meat and it be fine. I’d probably do 20 minutes next time for breast meat. 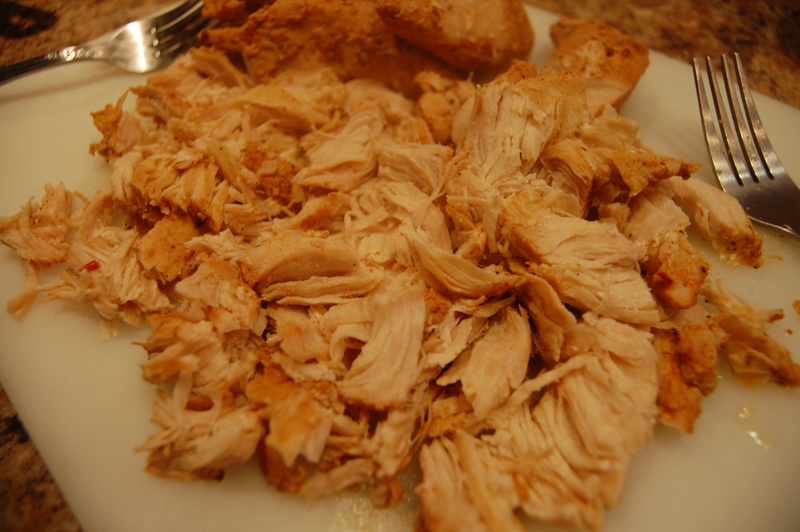 Once that was done, I removed the chicken and put it on the cutting board to pull apart. 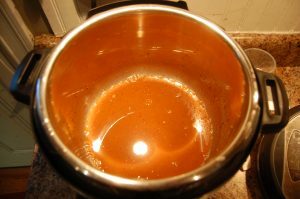 Take the sauce that is in the pot and pour it into a bowl because you’ll want to use a little of the cooking sauce if needed to make the finishing sauce go a little farther. Cut open the package of finishing sauce and put it in the Instant Pot. 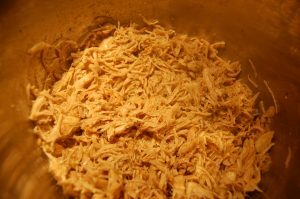 Add the pulled chicken and stir well. You really want to coat the pulled chicken with that yummy sauce. I turned my Instant Pot on to the saute function for the few minutes I was stirring and then added a ladle full of the cooking sauce to make it a little wetter. This is optional and you may not need to do that. Once it is heated through, turn off the instant pot. 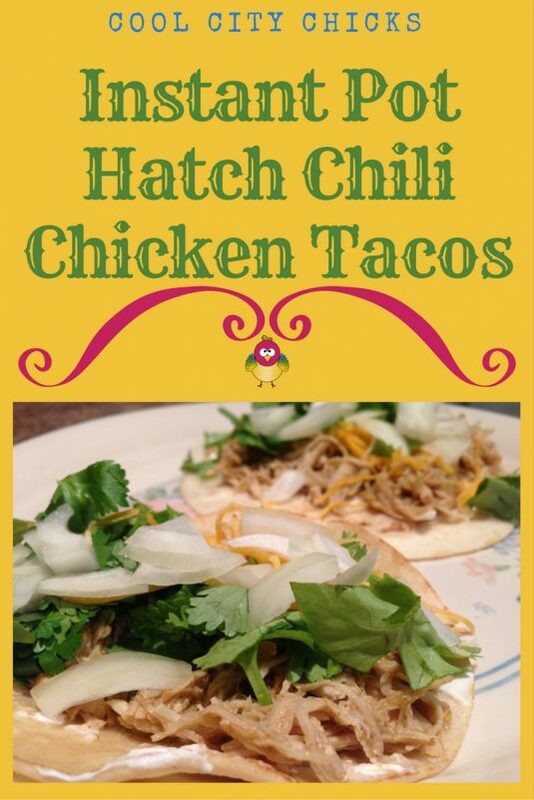 Use the hatch chicken on corn or flour tortillas. Top with favorite Mexican toppings. We love cilantro so we use a lot of it and fresh white onions. 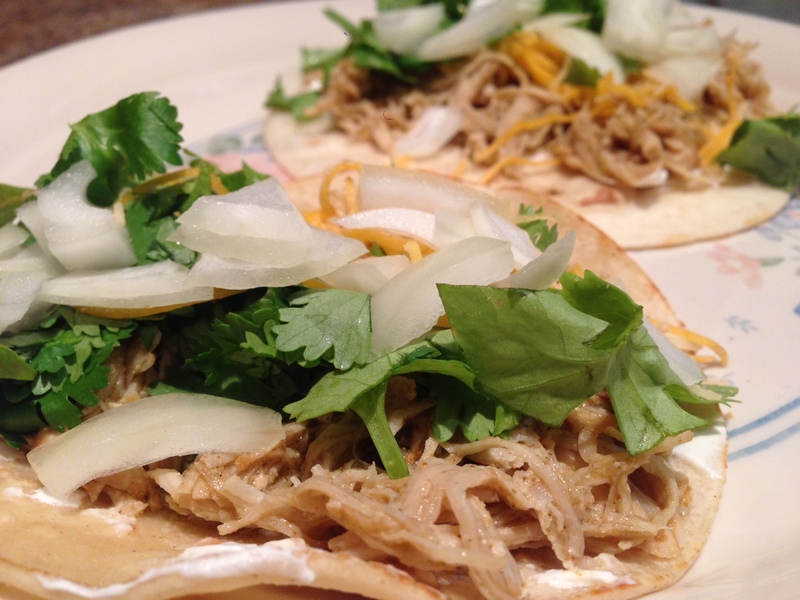 You can also add sour cream, cheese and taco sauce, but you probably will find that it is perfect with just the cilantro and onions. Just a note about fresh cilantro…you either love it or hate it. 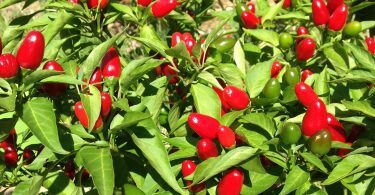 I’ve read that there is something genetic that makes people either taste the yumminess of the herb and it might taste like soap to others. If you taste the soap, just use lettuce or leave it off and use tomatoes and onions to get a complex flavor impact.